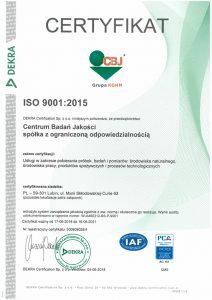 In January 2003 the Polish Centre for Accreditation granted us accreditation for selected test methods. For years we have been expanding the scope of accredited test methods and currently we have a very rich offer (over 600 test methods – Scope of Accreditation no. AB 412). Furthermore, since 2010 we have had a flexible scope of accreditation, which enables us to present our Customers a comprehensive offer of tests regarding natural environment, working environment and food, and to promptly respond to their needs. Since 1999 CBJ sp. z o.o. has been a holder of a quality management system certificate that is in conformity with the requirements of the PN-EN ISO 9001 standard.